Feel Free to be Uniform Free! 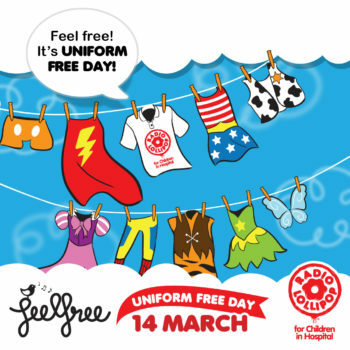 Transperth's annual Uniform Free Day is on again on Wednesday 14 March to raise funds for Radio Lollipop. Now in its 23rd year, the event provides much needed funding for the Western Australian teams to keep the radio on air and our volunteers on the wards! Bus and train passengers are encouraged to feel free to give generously or feel free to swap their uniform for free dress for the cost of a donation. The Perth CBD, all buses and metropolitan train stations will come to life on the morning of March 14 - there is bound to be a princess, a few storm troopers, Elsa from Frozen and other characters to brighten up the morning commute! And - for the first time this year - we are expanding the event to Melbourne, Brisbane and the Gold Coast. Please give generously if you are in the city. every donation counts and goes straight to providing our unique brand of play and entertainment and supporting the hospitals we work in. It's easy to organise a Uniform Free Day! If you want to know how your school, business or workplace can be involved, please call our Perth office on (08) 9340 8835.